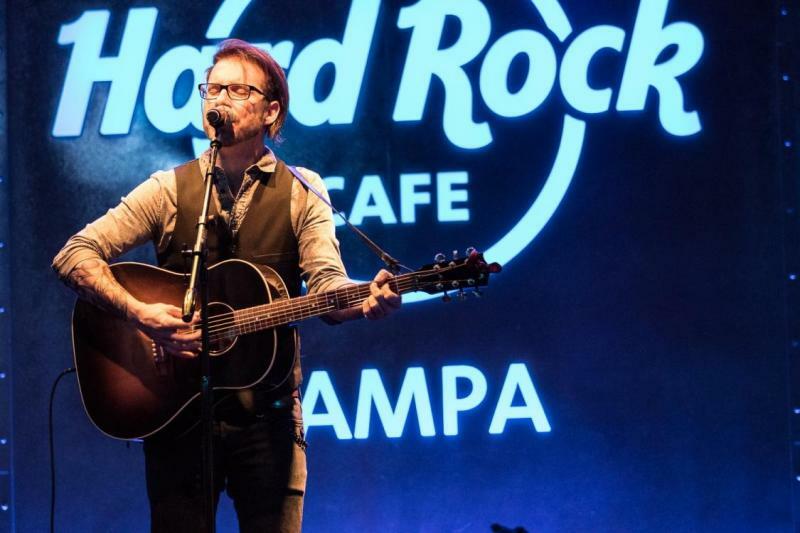 The Tampa Bay Acoustic Music Festival at the Hard Rock Cafe continued Saturday with another night of spectacular performances by Jeffrey Brockman, Kristopher James, Sunza Beaches, WD-HAN, and Lovestruck Robot. 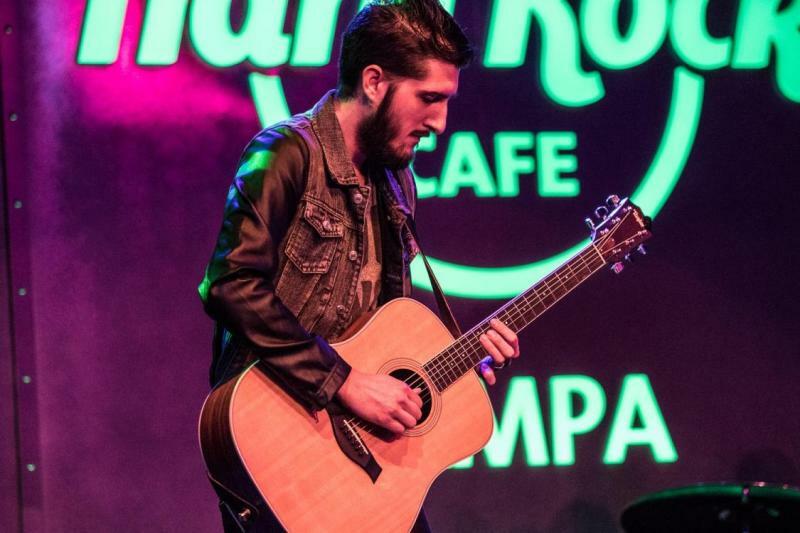 If you’re looking to see top-notch local acoustic talent, the Hard Rock Cafe is the place to be! Kicking off the night was Jeffrey Brockman. Jeffrey comes from a musical family and started playing when he received his first guitar as a gift from his Dad on his 16th birthday. 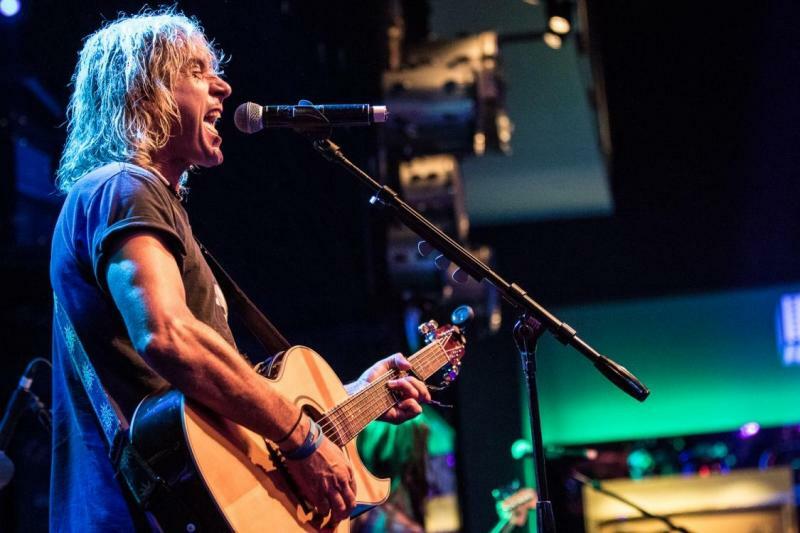 Jeffrey was also a poet in his younger years and his music came together when he combined poetry with his guitar and started creating songs when he was 18. 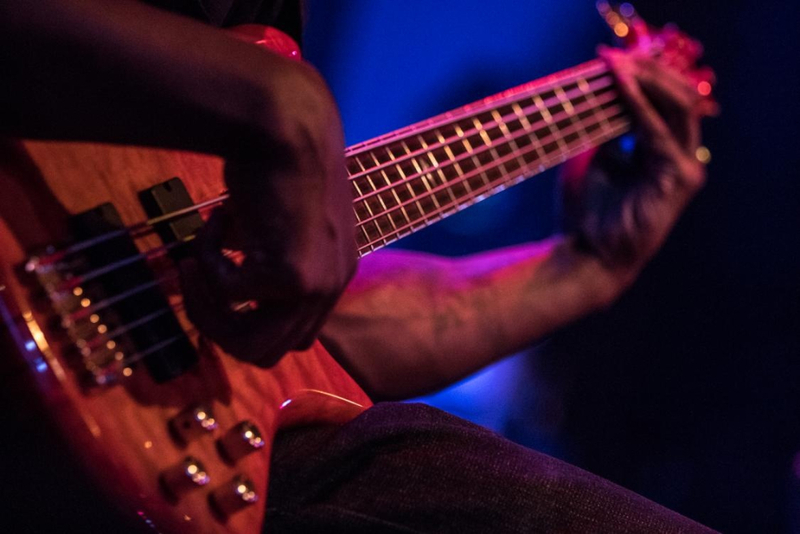 Jeffrey served in the US Air Force and spent many years playing in bands both overseas and in the US. 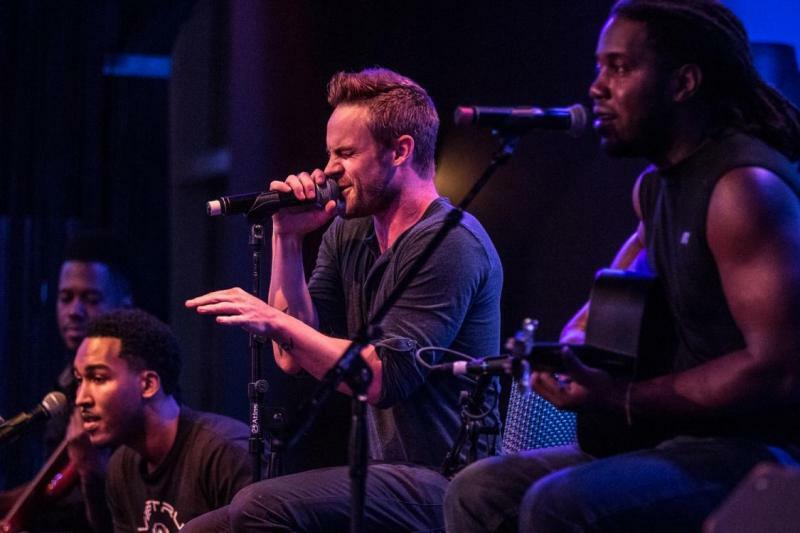 Eventually, he started a solo project focusing more on his songwriting and poetry. While living overseas he released his first album, Seven Year Itch, followed by his first EP, Morning Sun. He recorded and released Glimpses in 2013 just before returning to the US and retiring from the military. 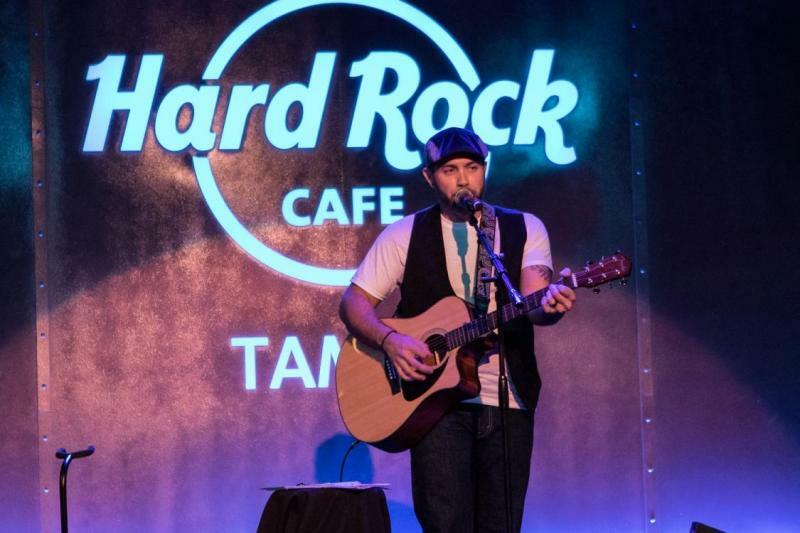 Now living in Tampa, Jeremy is continuing his career as a solo musician. Jeffrey played a set of all original music including “Fabricated Wings” a song about religion and faith and not judging others for their views, “Natural” a song about his wife and how their love is effortless and meant to be and “It’s You” another song about his wife and how life is easier when you find someone who shares your same interests, values and morals. I especially love the line, “You’re literarlly the only girl I know where PBR (the beer) is the only way to go”. Sweet. Jeffrey is currently recording a 6-song EP, Flickering Porch Light Sessions, which he expects to release early this fall. Until then, keep up with Jeffrey here. Next up was Kristopher James. Kristopher started his musical career playing drums in high school. He was unable to take his drum kit to college so he picked up his roomate’s guitar instead. He realized “girls like guitar” and taught himself to play. Over the years, he played guitar with a friend who sang and started to develop his singing skills. 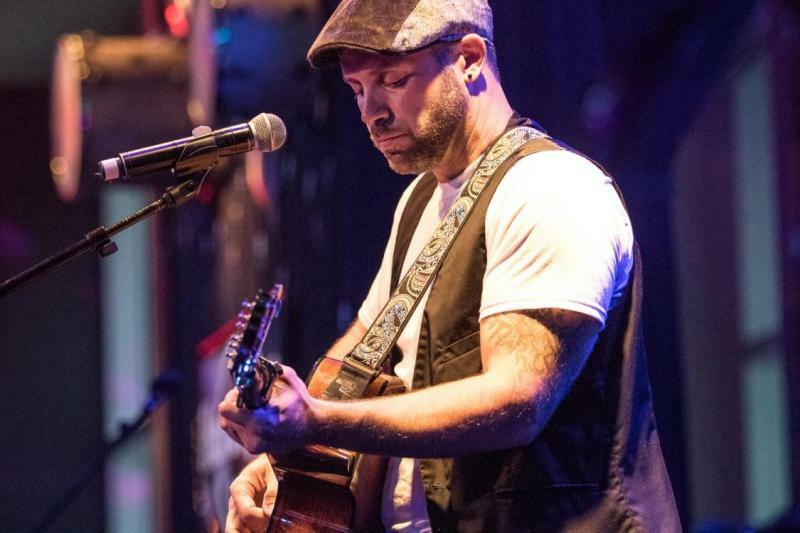 He didn’t start writing music until a year and a half ago after his son was born. He was havig a conversation with his wife concerning his insecurity about being a father and wanting to be a good dad. His wife suggested he write and “get it out”. Shortly thereafter his first song, “My Heart Wasn’t Ready”, a song about his son Kieran, was born. Kristopher also performed “Runaways” a song about people who are separate, running away with love and “Shadows” a song about some dark memories from his childhood and how we all have “shadows” in our lives we’re attached to and can’t run away from. Powerful! Kristopher self produced his first EP “Movement:1” and is in the studio now recording an album which he expects to release by the end of the year. Runaway with Kristopher here. Sunza Beaches took the stage next for a set of fun beach style tunes. This three piece band is composed of Scott on guitar and lead vocals, Kate on bass and back up vocals, and Kraig on drums. Scott started playing guitar in the 5th grade. He originally wanted to be a drummer but his Mom said drums were too expensive and bought him a guitar instead. 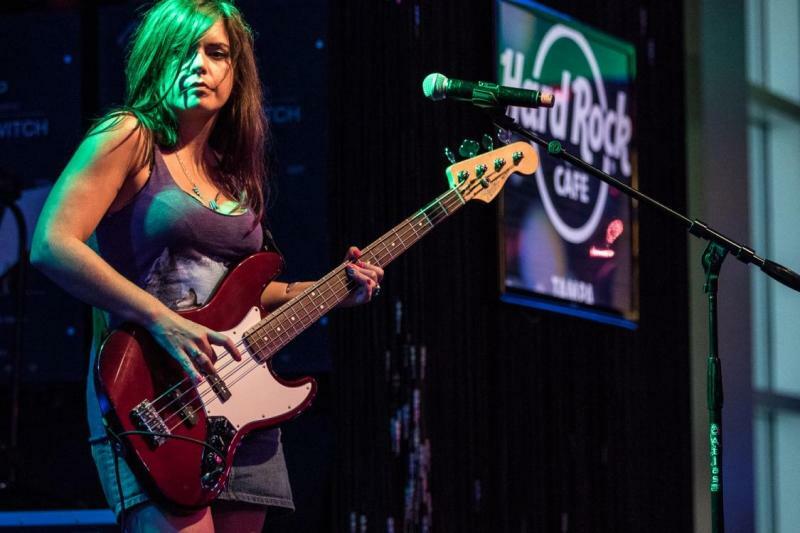 Kate has been playing bass since she was 12 and Kraig has been playing drums since the 2nd grade. The trio met while living on Sunset Beach and the band has played regularly at the Ka’Tiki Bar. Sunza Beaches played a set of mostly original songs including “Summer Nights” a feel good song about being outside around a campfire, “Rooftop” about escaping the clutter of the city and watching the sunset from a rooftop and “Hey There” about meeting girls on the beach and hanging out at Ka’Tiki. Covers included “For the Turnstyles” by Neil Young and “You Can’t Always Get What You Want” by the Rolling Stones. Head to the beach with Sunza Beaches here. WD-HAN, an alternative indie rock band, took the stage next. WD-HAN stands for “We Don’t Have A Name”. Name or no name, they were certainly memorable! Band members Spencer on vocals, Leah on drums and Cal on bass met in high school and have been playing in various forms of the band for the past 8 years. 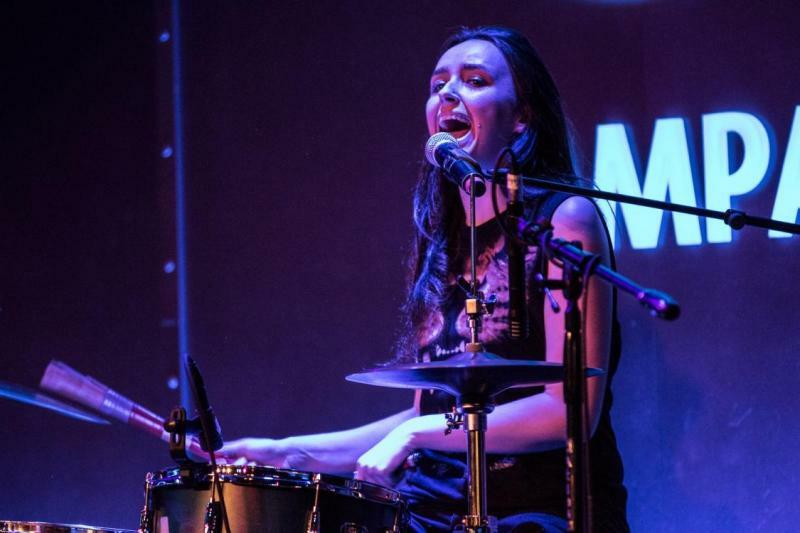 Leah’s Dad was a drummer and guitarist and Leah picked up the drums after her Dad bought the family a drum set for Christmas. Cal and Leah started playing together in high school and randomly called Spencer up to sing at one of their shows. He had practiced singing a bit before but had never sang seriously. Adrenaline got him through it and he’s never looked back! Songwriting is a collaborative effort. There’s only one band rule: they will try anything once no matter how ridiculous it sounds because sometimes the most ridiculous sounding things turn out the best. They played a set of mostly original songs including “Young Again” about that early time in a relationship when you’re just falling in love and the whole world looks amazing, “The Mystery” about a housewife and kids and “the mystery” of not knowing where Dad is, and “Name in Lights” about being a musician and not feeling alive unless you’re playing with your “name in lights”. Covers included “Barton Hollow” by The Civil Wars, “XO” by Beyonce, and “My Body” by Young the Giant. WD-HAN released their first album King of Castles in 2012 and are currently working on a “summer single” which they expect to release at the end of the summer. They are also working on a second album which they expect to release early next year. See them at The Bends in St. Petersburg on July 25th or follow The Mystery here. Closing out the night was Lovestruck Robot. 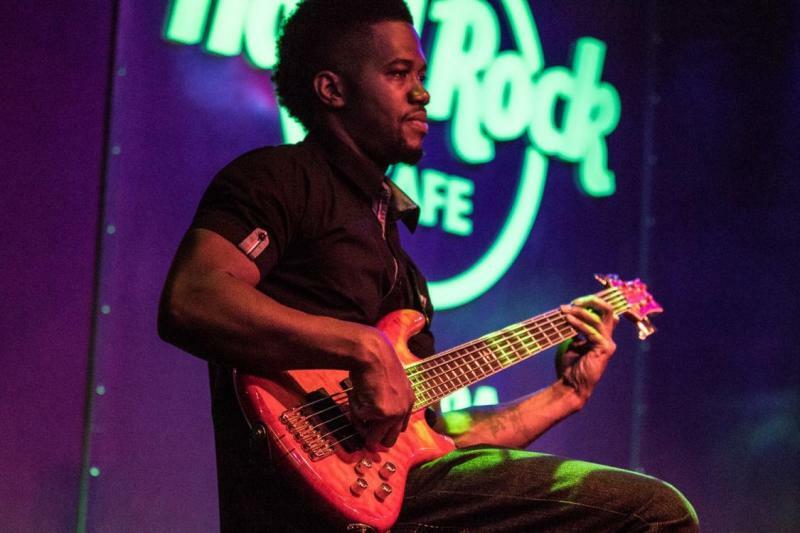 Fronted by singer/songwriter Jace Magee and supported by drummer Jonathan Parks, bassist Anthony Reed, and keyboardist Darrius Jamar, Lovestruck Robot has performed at notable live music venues and festivals throughout the Southeast. Lovestruck Robot played a set of cover and original songs including “Somebody’s Watching Me” by Rockwell, “Sugar” by Maroon 5 and “I’m Not the Only One” by Sam Smith. Lovestruck Robot released their first album “I Wanna Be In A Band” in 2011. Along the way they have released a collection of singles including “Random Hi5’s”, “Leprechaun” and “Smoke Show.”. Get Lovestruck here. 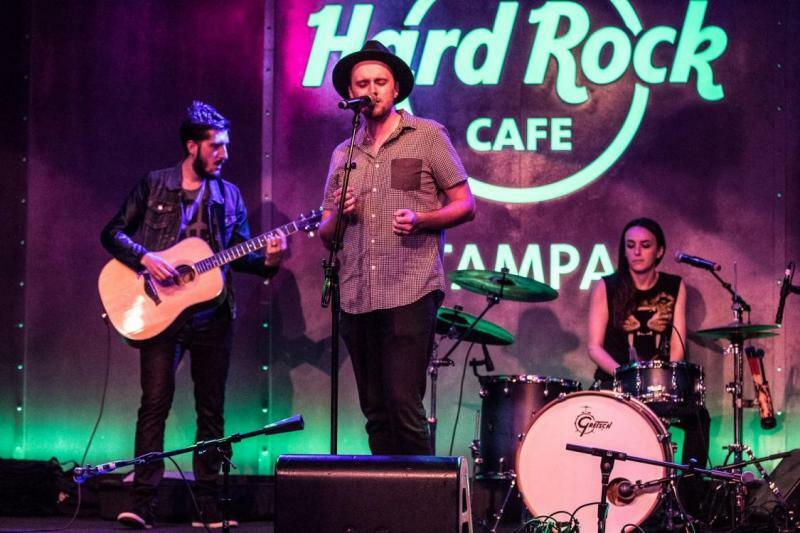 The Tampa Bay Acoustic Music Festival at the Hard Rock Cafe continues Sunday night and throughout the month of June with a fantastic lineup of local bands. 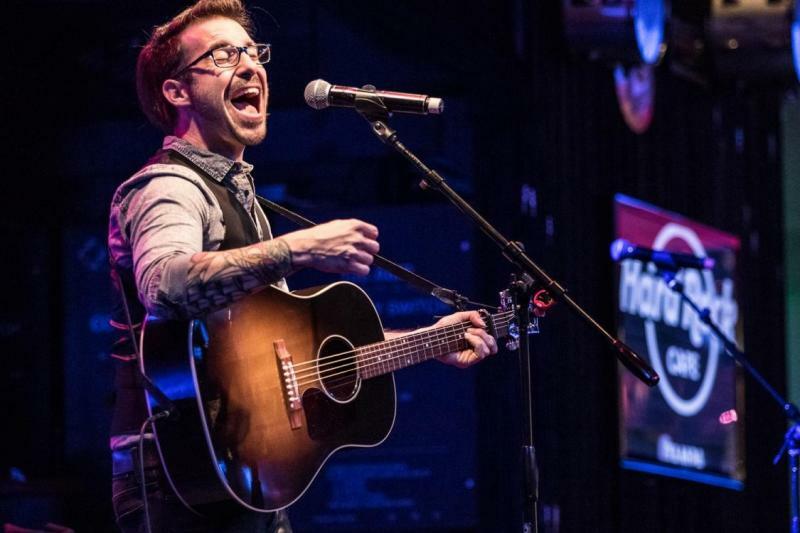 Check out the schedule here and head to the Seminole Hard Rock Hotel & Casino Tampa to hear some of the best local live acoustic music around!